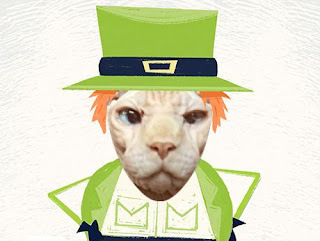 A few years back, I stopped posting St. Patricks’ Day videos with the cats. I’m not Catholic or Irish and in retrospect didn’t think it was funny to promote commercialized, bastardized religious stereotypes. A commentary on CBS Sunday Morning two years ago by Boston Globe columnist Kevin Cullen was key in my decision. However, Mr. Cullen also mentions his Aunt, who welcomed strangers into her home for the holiday. This gesture was as much the loving spirit of this woman’s soul as much as it was showing her pride in being Irish, giving credence to the saying that everyone is Irish on St. Patrick’s Day. I stopped posting Jib Jab video of the cats on St. Pat’s because most were promoting that being Irish was about being drunk. However this morning I thought it appropriate to post this link to their St. Pat’s video that I believe depicts well the “Everyone’s Irish on St. Paddy’s Day” sentiment. Click on the link "Everyone's Irish on St. Paddy's Day." Enjoy your celebration, and stop promoting stereotypes.